One of my favorite annuals that I grow from seed each year, for its large showy 2 to 3 foot greenish-red leaves is the Castor Bean Plant. The castor bean, along with the Elephant Ear and Canna adds a tropical vibe to my upstate New York, USA, zone 5-4 garden. 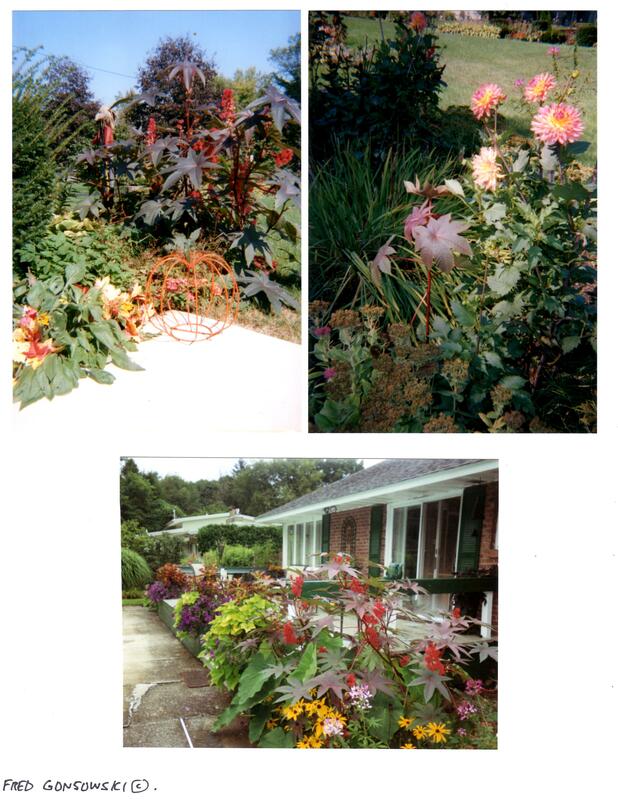 Years ago I purchased young castor bean plants at a garden center in Salisbury, Connecticut, USA, which is in the north-west corner of the state. The lady who sold them to me was telling potential customers that the plant was poisonous, especially the seeds. She was telling people that if they had children or animals, who could possibly chew on or eat the seeds, to think twice before purchasing the plants. Planting Castor Bean Plants ..Castor bean plants are offered for sale in late Spring, and should be planted in your garden when all dangers of frost have passed. In my neck of the woods, that is around Memorial Day. Plant (Space) young castor bean plants 2 to 3 feet apart in all directions, so they have room to spread out. They will be growing 5 to 7 feet tall. Put them in a location that gets full sun to partial shade. Full sun is 6 plus hours of direct sunlight daily, most likely coming from the south-west. Partial shade is 4 plus hours daily, of direct morning sunlight, coming from the east. If you are starting castor beans from seed, one option is to plant the seeds directly in the ground. I like to start mine outside in 4 inch plastic pots, a few weeks before in-ground planting time. I plant 2 castor bean seeds per pot, trying to space them far apart as possible, so I can easily separate the new seedlings at planting time. With my finger, I make the two holes, insert the seeds and cover them with 3/4 to one inch of soil. After planting up many pots, I cluster the pots together in a sunny place in the garden, so I can easily water them all at once. If there is a chance of frost, I can cover all the clustered pots with an old sheet or blanket, to keep all the plants warm and protected. Castor beans will emerge from the soil in 8 to 12 days. Before siting your castor bean plant, if you can, amend (improve) the soil with a shovel each of dehydrated cow manure and sphagnum peat moss. Those two products will boost the organic quality of the soil, and energize the plant. After your plant(s) have grown to about 2 feet tall, insert a 3 to 4 foot bamboo stick along side the stem, and loosely tie it with a bit of jute string. This will help support the plant during wind storms. Water your castor bean plants twice a week, or as needed. If you can, give them a drink of water-soluble fertilizer every 2 weeks, starting a month after planting, and throughout the rest of the growing season. Saving Seeds for Next Year ..Collect seed heads from castor bean plants starting in mid Fall when the clusters of seed pods are starting to dry up and turn a gray-beige color. Collect seed heads from your biggest plants, right up to the killing frost. Lay the bunches of seed heads out flat on the top of a cardboard box, old tray, large dish, etc in one layer, in a well ventilated place, for a few weeks to completely dry. If you don’t they will mold. Store them over the Winter in a place, like an unheated garage. I just leave mine in the top of the cardboard box. Don’t try taking the seeds from their shells until you are ready to replant them the following Spring. Taking the Seeds from their Shells ..It is relatively easy to remove the castor bean seeds from its shell. I suggest wearing gloves to protect your fingers from the prickly spikes that cover the seed head. The castor bean seed pod has ribs, kind of like a pumpkin. With a pair of hand pruners, make a cut through the seed head on one of those ribbed lines, that will divide the seed pod in half. Next take your pruners and make a cut close to the outside edge of one of the seed membranes. You should be able to pop out a seed after making that cut. The castor bean has 3 or 4 seeds per pod. Try not to slice / cut into the bean seed, that will release the Ricin, the poisonous part. Any sliced through beans should carefully be thrown away. After extracting and planting your castor bean seeds, thoroughly wash your hands and pruners. Save any unplanted seeds in a place where kids or animals will never get to them. Finally, If you are wondering if you can plant castor bean plants in pots / containers? Yes is the answer! Pick a pot about 12 to 14 inches wide, and 12 to 14 inches tall, to plant it in. Plant some shorter draping plants at its base. The castor bean will look nice, but its leaves and height might be smaller. I hope this post was helpful to you. The castor bean really is a wonderful addition to your Summer garden, as long as you take some precautions. This entry was posted in Roses, Peonies, Tulips, etc, The Autumn(Fall) Garden, The Spring Garden, The Summer Garden. Bookmark the permalink. Can the root be left in the ground over the winter? I was trying to pull it out but it is so strong, and I have no help. Hi there Choctini, once the frost gets it, it is dead. Take a shovel and dig around it and pop it out of the ground. I do that when popping up dahlias, cannas, and some larger annuals like tall sun flowers that have thick stems and substantial root systems. Can castor beans plants be safely transplanted and when? Hi there Jo, Each year I start castor bean plants from seed, I plant my seeds single in 4 inch square pot. You can safely transplant them after the first two leaves have unfurl and there is no danger of frost. I planted up some a week or so ago, and still have others to put into the garden. If the plants like your soil, and the location for sun, they will grow about four to five feet tall. Leave about 18 to 24 inches between plants so they have room to expand. Happy Summer to you, and have a great time planting!